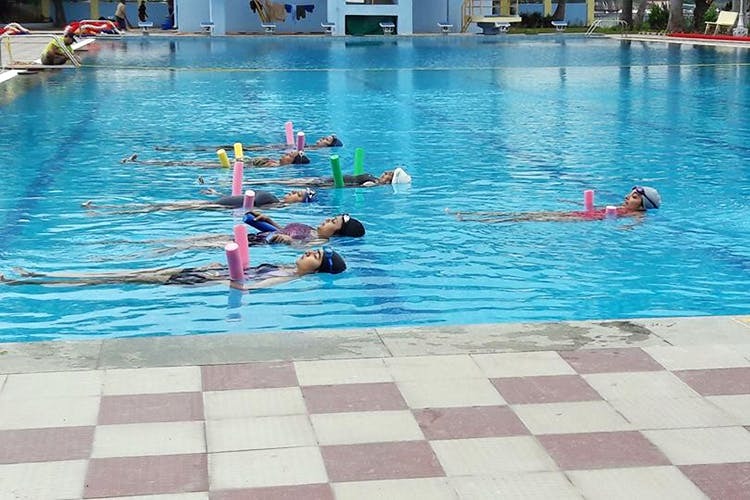 Swim like a fish under the guidance of renowned professional swimmer, Nisha Millet, at the Nisha Millet Swimming Academy in Bangalore. As far as life skills go, swimming is somewhere on the top of that list as it’s a useful as well as a fun talent to have. Acquire the skill by learning from one of the best people in the game. We’re talking of Nisha Millet, of course. The Olympic swimmer who has many accolades and achievements to her name, including being the only Indian athlete to ever win 14 gold medals at the National Games in 1999. She is the founder and head coach of the institution which strives to bring the fun back into learning swimming. An AUSTSWIM certified centre, which is the gold standard for swimming academies in Australia and globally, you’re in good hands here. With around 30 passionate coaches, including Millet herself, training batches of not more than eight swimmers, every student gets plenty of guidance and attention at these classes. With beginner, intermediate and advanced classes on offer, pick a pace that suits you and wade away. They even have parent-toddler classes and aqua pilates sessions too. They have swimmers as young as six months old and as old as 84, so there are no age limits or restrictions. Conducting classes in over nine pools across the city, figure out a location and schedule that works for you and take the plunge by signing up. With classes happening at different locations in the city, including the Skydeck Pool at VR Bengaluru and the swimming pool at Catholic Club, with the main centre being the Kensington Pool at Ulsoor, find a spot that isn’t too far off from you. The classes are mostly 15 class packages conducted through the week or on weekends alone. Priced from INR 5,000 to INR 7,500 per package, you can find out more on their website here or their Facebook Page here.